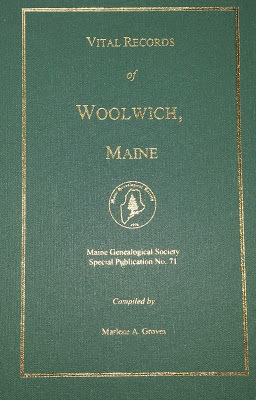 Vital Records of Woolwich, Maine (2015) compiled by Marlene A. Groves is now available exclusively through the Maine Genealogical Society (MGS). This 650 page book was indexed using ENIndexer and includes an every name index of 17,239 individuals. In this book, Marlene A. Groves has transcribed, from images of original documents, birth, marriage and death records from the town of Woolwich from the 1740s through the 1890s. In addition, she has included a list of ear marks registered in the town. Ear marks are an interesting bit of genealogical information, showing how your ancestors marked their livestock as their own, but they also help leave clues about people and their relationships. 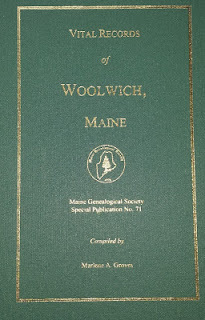 Maine Genealogical Society Special Publication #71 is available in both paperback and hardcover versions and MGS members enjoy a $10 discount off the retail price. If you have early Maine ancestors, this is a book worth checking out!